Born in Chicago, Grunsfeld received his Bachelor of Science degree in physics from the Massachusetts Institute of Technology in 1980 and his Master of Science and PhD in physics from the University of Chicago in 1984 and 1988, respectively. He is presently NASA's Associate Administrator for the Science Mission Directorate. Grunsfeld held academic positions as visiting scientist at the University of Tokyo's Institute of Space and Astronautical Science from 1980–81; graduate research assistant at the University of Chicago from 1981–85; NASA Graduate Student Fellow at the University of Chicago from 1985–87; Grainger Postdoctoral Fellow in Experimental Physics at the University of Chicago from 1988–89; and senior research fellow at the California Institute of Technology from 1989–92. 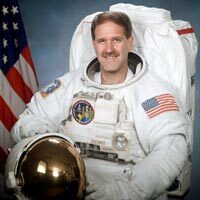 Grunsfeld reported to NASA's Johnson Space Center in 1992 for a year of training and became qualified for flight selection as a mission specialist. A veteran of five space flights, including three missions to service the Hubble Space Telescope – STS–103 in Dec. 1999, STS–109 in March 2002, and STS–125 in May 2009 – he has logged over 835 hours in space, including nearly 60 hours of Extravehicular Activity during eight space walks. He served as the NASA Chief Scientist detailed to NASA Headquarters in 2003–2004, where he helped develop the President's Vision for Space Exploration. His research has covered X–ray and gamma–ray astronomy, high–energy cosmic ray studies, and development of new detectors and instrumentation. Grunsfeld has conducted observations of the far–ultraviolet spectra of faint astronomical objects and the polarization of ultraviolet light coming from stars and distant galaxies.